I grew up in the eighties where television was inundated by all kinds of extra-terrestrial robots trying to save mankind from doom or happy, fuzzy cartoons full of caring creatures trying to share love and colour throughout a bleak and dark world. While I loved the robots for the fast paced action and, lets face it, awesome theme songs: the latter obviously held a special place in my little girl’s heart. Especially one show called Rainbow Brite. 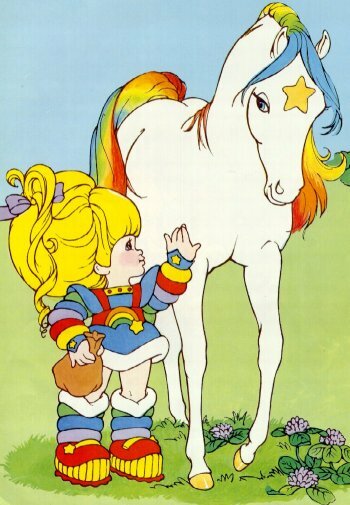 Rainbow Brite lived in Rainbow Land with Rainbow Sprites and rainbow EVERYTHING! She had an amazing talking horse with a rainbow mane and they galloped OVER RAINBOWS! Yes, rainbows featured heavily and rainbows had me in their magical, colourful grip. As a kid I lovingly drew them with my paints and crayons, colours in order as I recited ‘ROY.G.BIV’ over and over in my mind. I would search for the pot of gold and be amazed by the rainbows as I played in the summer under the sprinkler and try to catch the pretty drops. I was always disappointed when once caught, I held only plain water in my hand and not prisms of colour. For years I was obsessed with colour. Now in my late 20’s I dress mostly in black and I no longer search for the pot of gold or hang crystals in my window. Rainbows don’t quite hold that same fascination and joy as they once did. They’re still beautiful, don’t get me wrong, but sadly I don’t think I’ll ever get that “OH MY GOD! A DOUBLE RAINBOW! !” feeling the next time I see one stretched out across the sky. BUT! Recently I have come across a few things that made me a little excited and brought back a little bit of that colour infatuation and reminded me that although I may be getting older I can still appreciate rainbows and unicorns all in a different way. Bacon is one of my favourite things and some crazy genius with too much time out there thought that dying bacon would be a great idea. And I have to admit, I kind of agree! Crunchy, salty rainbow pieces. yum! At Pop-Tart World. Only in America! My teeth ache just thinking about it, yet I am fascinated. 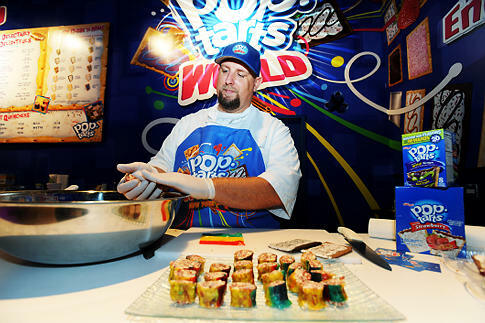 It’s Pop-Tarts wrapped with Roll Ups! Seriously! A childhood dream! And number three, (my favourite): Canned Unicorn Meat! Oh yes! I gaze at this with lust and wonder. 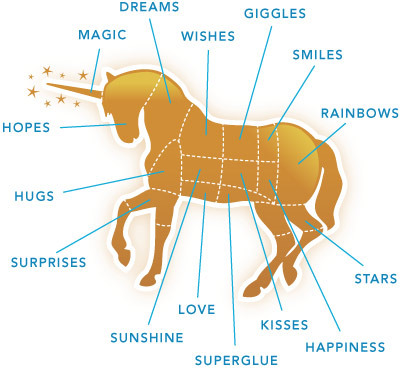 Unicorn meat. Is it like rainbow bacon? Do unicorns bleed rainbows? Unicorns and rainbows go hand in hand, is this why? It’s a joke, from ThinkGeek and I love it.Partly because its “sparkly meat lends the unmistakable air of class and sophistication to your parties” but mostly because it talks straight to that rainbow centre of childhood love of magic and colour that’s still there in my adult brain. But, as an adult, I can laugh instead of cry at the thought of unicorn in a can.